1. Pre-heat the oven to 150 degrees Celsius. 5. Throw the mushrooms in on their back for about 2-3 minutes then flip. Cook another 2 or so minutes then place on a plate. 6. In the same pan, pop in a little more olive oil then place the haloumi in the pan. 7. Cook for about 1 minute on each side, then drain any excess oil on a piece of paper towel. 8. Place all ingredients on a plate & eat immediately! 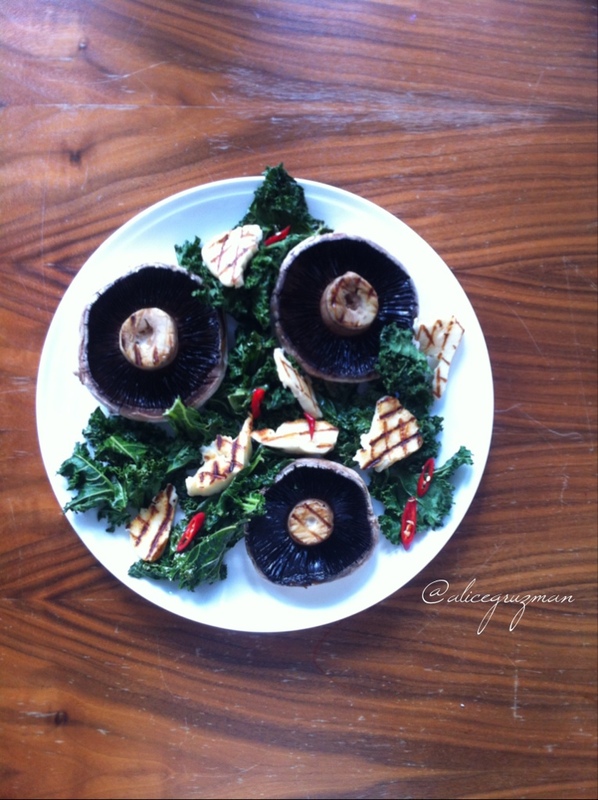 the earthiness of the mushrooms, saltiness of haloumi, freshness of kale & heat of the chillis compliment & balance each other well. This entry was posted in Recipe and tagged cleaneating, dinnerin10mims, dinspiration, easymeals, glutenfree, healthy, iqs, iquitsugar, lightdinner, quickprep, refinedsugarfree, vegetarian by 6 Clean Ingredients. Bookmark the permalink.